Omaha Public Power District's chief executive has recommended closing the Fort Calhoun nuclear power plant. OPPD President Tim Burke looked distressed in the television report the begins stating the utility is crunching the numbers on complying with the Clean Power Plan. In an interview, Burke told The World-Herald on Wednesday that regulatory pressure to reduce carbon emissions, a goal to make rates more competitive and depressed prices on the wholesale electricity market influenced management’s recommendation to shut down the plant. That's not entirely honest. As a smaller unit, the 478 megawatt Fort Calhoun is more expensive, per megawatt-hour than much larger nuclear power plants, and it's correct to note downward market price pressures due to cheap gas and heavily subsidized wind, but for Nebraska the challenge of meeting the Clean Power Plan's targets is entirely detached from a goal of reducing emissions. Nebraska is the only of the contiguous 48 states that the US Energy Administration shows increasing coal used to generate electricity from 2007 to 2015. The Clean Power Plan shows a base year of 2011, when over 70% of the electricity generated in Nebraska came from coal. Because the Clean Power Plan offers Nebraska the option of a "rate-based" option and their 2011 emissions intensity was high, they need only get down to 1296 pounds (CO2 equivalent) by 2030 (588 kg/MWh). Because existing nuclear units are excluded from the the CPP calculations, which were developed by the anti-nuclear Massachusetts's lawyers of the National Resource Defense Council, the real world application can be strange. Nebraska could replace all low-emission nuclear supply with natural gas generation and exceed it's CPP "rate-based" target. 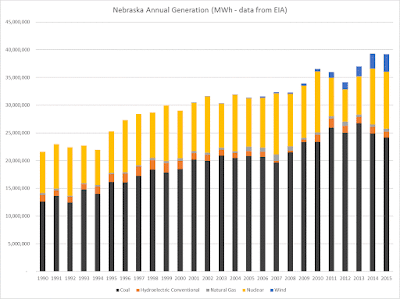 According to my calculations, Nebraska could shutter all its nuclear power plant and tear down all its industrial wind turbines and still meet its 2030 CPP "rate-based" target, although actual emissions would rise.